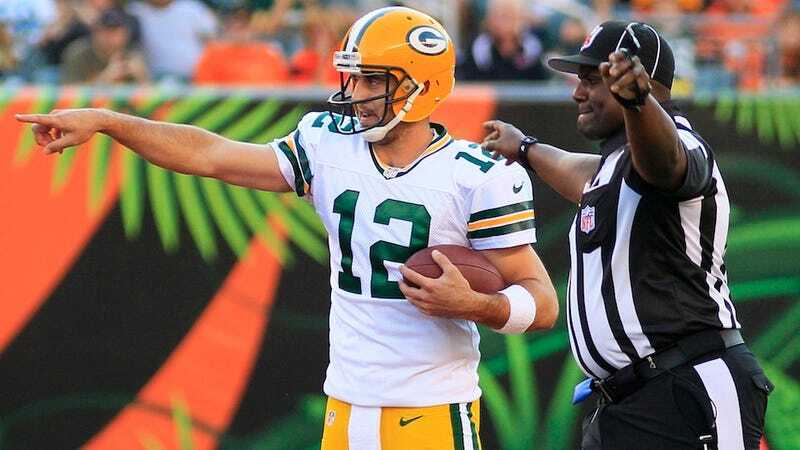 Aaron Rodgers Says The Replacement Refs "Have To Understand The Rules"
Every morning, the fine folks at Sports Radio Interviews sift through the a.m. drive-time chatter to bring you the best interviews with coaches, players, and personalities across the sports landscape. Today: The Packers QB has a few bones to pick with the replacements. Aaron Rodgers joined Jason Wilde on ESPN Radio Milwaukee to discuss the loss to the 49ers, the short week to prepare for Chicago, his track record with fourth-quarter comebacks, the replacement officials and some lighter personal stuff. "It's just one game. Yeah it's frustrating; we put a lot into it. A lot of preseason, offseason, training camp snaps. But that's a really good football team. And I think we're a really good football team too, but we made more mistakes than them. We didn't capitalize on some opportunities we had on offense and didn't stop them when we needed to on defense all the time and that's why we lost. "I think in both of those cases they were innocent statements. We want to focus on the things that we do well, and we feel like if we do those things and do them well we will be in position to win the game, or win the game. I don't think either of those two guys were trying to disrespect the Giants or the Niners in those situations. They were just trying to state something that's been said by coaches for as long as we can remember, and we've all played football for a long time. It's more about what we do than what they do. But the Niners beat us. They played better, they executed better, and they deserved to win the game." "It's better. Because you get back out onto the field. You get back on the field quickly; the toughest part about this job is really the weeks after a loss. It's a grind regular season, and it's even worse when you lose because you have that feeling that you just can't wait to get back onto the field and try to remedy the things that went wrong. But the silver lining here is that we get to get back out there in a couple of days and play a common opponent." "Well I think this is a week that really shows what I truly believe it takes to be successful in this league; you have to be self-motivated. So this week, more than any other week, shows which guys are going to be ready to play Thursday. There isn't a chance to practice all of the plays that we've put in. There's not enough practice reps, there's not enough time. We're all sore Monday's and Tuesday's, those are usually our recovery days. So obviously we're all feeling the effects of a game two days ago. It's about who's going to be ready to play on Thursday, and know their assignment, and have put in the preparation time. These are difficult weeks, but the reward is going to be hopefully is a victory and a chance to relax next week before some extended time off this weekend. And a Monday night game which gives us even more time off next week as well." "Yeah, I don't really care about that. I've had a lot of game winning drives in the second and in the third quarters. There hasn't been a ton of situations for those comeback opportunities in the last couple of years. If you play well in the first three quarters there's not going to be those situations, so I like playing well in the first three quarters." "They're under a lot of scrutiny, and the ones we had last week deserved the scrutiny. You have to understand the rules." "You have to try to curtail some of your frustration I think. It's just frustrating when you're positive that there's either a missed call, or that the rule was not interpreted the way that it's supposed to be interpreted. There were multiple instances of that, and when you watch the film back it's frustrating. That being said, there were some just bizarre calls on both sides. Anybody who watches the TV copy, I mean I saw it from the sidelines, but we scored a touchdown on a legit block in the back. I don't know what happened on that. It has to hopefully get better." "There's still disbelief. I can't say it's comical, but I don't feel bad because we had some bad ones our way as well, but I'm just surprised that you missed that one. That one was a discrete block in the back." "I'm pretty sure that I was under a fake name at the Super Bowl. And I had a gentleman call me. I'm not sure how he got my room number. For me when I get a phone call it's usually Brett Goode or John Kuhn or Matt Klein or somebody who has a question or wants to talk to me, or asking where we're going for dinner. All of them can just contact me on my cell phone, but either they've been to my room already, or we were hanging out, or playing cards or whatever. I change up the fake name so they don't know it. But needless to say, this guy called me. I answered the phone and I'm sleeping. It might have been like Tuesday afternoon, but I'm sleeping. And he's like hey, so and so, and I'm like, hey I'm sleeping. So he calls back and leaves a message. But he was basically leaving this message to get me to leave a donation to his minister or something. And he finds me at the hotel as well. It was kind of a little stalkerish. I think he had some help from a former Green Bay Packer. That's my own personal conspiracy theory. So that's kind of the only time that somebody has bothered me there. Not counting the prank harassing calls that I got the night of the Super Bowl, but I'll save that for my book." "I was driving in my car. Because of the time difference I was, I think school started at 8:25 or something, so I'm driving in my car, listening to my country radio and I hear them kind of break in and they're talking about something on the radio about something in New York. I wasn't really paying attention, and I kind of turned it up, and couldn't believe what I was hearing and you know, got in the school and I always really respected this about our teachers that day, they realized this thing was a lot bigger than class, and a lot bigger than what was going on that day, that it was really out of respect, the need to pause and understand the human part of this, and how it kind of brings people together, a tragedy like this. We stopped and watched a lot of coverage all day, and it was a very quiet day on campus. I remember just having this weird feelings about how this could happen in America and feeling for the victims right away, and just disbelief as, I think on the radio the second tower, the first tower had gone down when I was driving into school, and the second one went down almost before our eyes, and it was just a very numbing time to see that happen." "Without a doubt. That's a good question. I do think about that and I think we've reached my own personal max on that. Over-saturation, overexposure is something that I don't want to happen. I've picked, I think, my endorsement partners pretty wisely, and really enjoy those partnerships. Had a lot of fun doing those commercials, excited about the next State Farm commercial, I think it's going to be one that's going to be really funny. Again, making fun of me, which always seems to come off pretty good, but I do think about that. But we've made some good commercials, so they kind of get out there." "The smugness of Alex Trebek when he corrects a contestant on Jeopardy. I just think it's so incredible. It's like, ‘Alex, really, you knew that one?' I mean, he's just so smug about it sometimes. I love Celebrity Jeopardy. That's another one of my favorite things. I mean, SNL and MADtv has been the source of a lot of laughter. MADtv did a spoof on the Abercrombie commercials, and just Abercrombie in general that's just unbelievable, so I would recommend going and checking that out if you have a little time." • Bill Belichick gives a rare interview. • RichRod really enjoyed his time off from football. • Doug Collins thought the Sixers (before Bynum) had gone as far as they were going to go.